DENVER — A subterranean divide among Democrats between backers of teachers unions and those of charter schools and other education innovations is helping shape key gubernatorial primaries, even as red-meat issues like guns, inequality and President Donald Trump have dominated the races. In California, former Los Angeles Mayor Antonio Villaraigosa’s campaign has been kept afloat partly by more than $20 million spent by a political committee funded by supporters of charter schools and other educational initiatives. In New York, actress Cynthia Nixon, a fierce critic of charter schools, is challenging Gov. Andrew Cuomo, who’s sparred with teachers unions. The most public split comes in Colorado, where two Democrats with deep roots in education policy have come under attack by the state’s biggest teachers union on behalf of the state’s former treasurer, Cary Kennedy. “It’s a further signal of the Democratic party, irrespective of these candidates, drifting pretty far to the left, where issues that used to be part of the Democratic mainstream become controversial,” said Eric Sondermann, a nonpartisan political analyst in Colorado, adding that Trump and his controversial Education Secretary, Betsy DeVos, had helped turn the party’s base against so-called “reform” initiatives like charter schools and teacher evaluations. Still, there’s a limit to the depth of the divide. Democratic candidates in all the races have embraced the cause of teachers who walked out this spring for better pay and more school funding, as well as urged an infusion of public money into education. And the split has largely been drowned out by debate over things like guns and the response to Donald Trump. Villaraigosa is furiously trying to secure a spot in the state’s unusual primary on Tuesday, in which the top two vote-getters of any party face each other in November. He’s been aided by $20 million in spending from a superPAC funded by charter school groups and their wealthy donors — including Netflix founder Reed Hastings and former New York Mayor Michael Bloomberg. Teachers unions have spent about $1.3 million supporting front-runner Gavin Newsom, the lieutenant governor, who has called for more state oversight of charter schools. 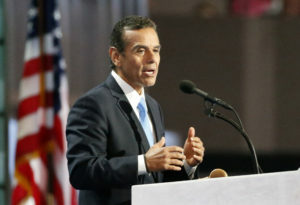 Villaraigosa angered teachers unions as mayor, when he took over several failing schools and was critical of the union, even telling the Los Angeles Times editorial board that his proposed reforms would require “a holy jihad” against the union. The money from education interests has helped keep Villaraigosa competitive in the state’s nonpartisan primary, where the top two vote-getters advance to November’s election, but he still risks finishing behind Newsom and Republican businessman John Cox. The issue also hasn’t been on the front-burner in New York, where Nixon has hammered Cuomo mainly over the New York City subways and broader issues of economic inequality. Cuomo himself has tacked left on education after angering teachers unions in 2015 with a proposal to make it easier to remove incompetent instructors. The prior year he gave his full-throated support to charter school advocates. In Colorado, where residents can apply to any school they choose and teachers unions have been relatively weak, Democratic candidates all talked about their plans to expand education — to change the state’s tax-limitation measure and allow more funding to create universal, full-day kindergarten and, in the case of former State Senator Mike Johnston, free community college for adult job retraining. But the issue wasn’t divisive until this past week, when a group funded partly by the state’s biggest teachers union launched a television ad on behalf of Kennedy that attacked two of her rivals. The spot accused Polis of supporting vouchers because, as chair of the state board of education, he spoke favorably of a 2003 proposal that included them — though Polis said he opposed the version of the measure that passed the state legislature three weeks later. It also slams Johnston, a former principal and teacher, for authoring the state’s teacher evaluation law. Johnston, who ran a school serving youth in state custody, said in an interview that the program grew out of his work as an education adviser to Barack Obama and that Kennedy hadn’t objected to it before the campaign. “Obama led on it, I led on it and we passed it,” Johnston said. The attack drew a sharp response from Polis and Johnston, who contended that Kennedy violated a pledge to refrain from negative attacks. But Kennedy has refused to disavow the spot or ask her supporters to take it down. “Teachers believe the differences between the candidates are important and we need to respect that they are independently expressing their opinion,” Kennedy said in an interview. Tension has been building for months over education among Colorado Democrats. During the party’s convention in April, activists tried to forbid the group Democrats for Education Reform, which backs candidates who support innovations like charter schools and evaluations, from using the party’s name in its title. Still, the group has not endorsed a candidate in the Democratic primary. “I think there’s more common ground than less common ground,” said Jennifer Walmer, the group’s executive director. Jonathan J. Cooper in Sacramento, California and Michael Hill in Albany, New York contributed to this report.